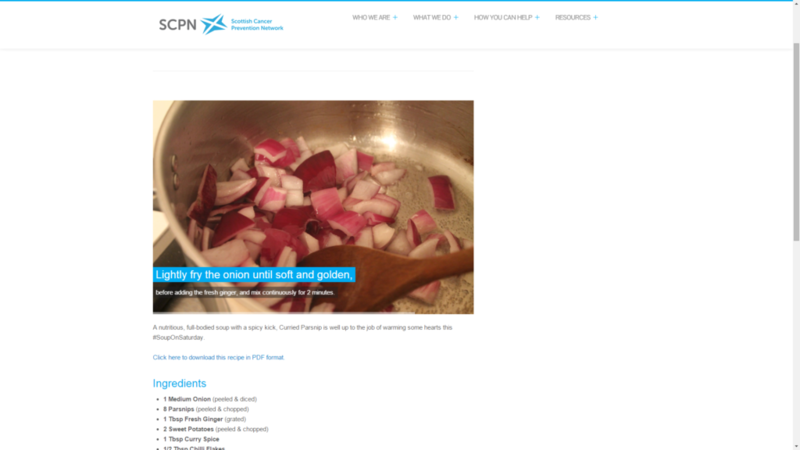 We’re delighted to announce that the new SCPN website is now up and running, a welcome improvement from the previous version. From cancer prevention advice, to conference presentations and #SoupOnSatuday recipes, our new website contains the information you need, on computers, on phones and on tablets. We’d like to thank Eóin McCann, who was instrumental in the site’s creation. To celebrate the launch, we have produced a set of 10 tips for using the site, to help you find your way around. Our new healthy meetings scorecard exists in a handy electronic form, so you can fill it in and submit it online, without having to print or email two copies. If you prefer a physical version of the scorecard, you can download a PDF scorecard, which can be filled in electronically without the need to print or scan. Adobe Reader will allow you to enter the details into the boxes, and select tick boxes when scoring the meeting – even doing all the adding up for you! You can then save the document, and send one copy to healthymeetings@cancerpreventionscotland.org.uk, and another to the meeting organiser. At https://www.cancerpreventionscotland.org.uk/prevention/, you’ll find a useful list of cancer prevention advice. Soon to be updated, the list can be shared with patients, colleagues and friends/family, as a quick source of cancer prevention advice. 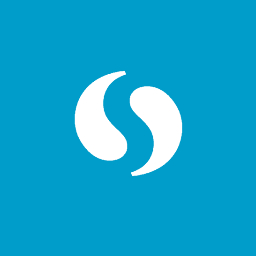 On our newsletter page, you can register to join our mailing list, and receive monthly updates from the SCPN, as well as our quarterly newsletter. There’s also a lovely blue signup box at the bottom of each page. 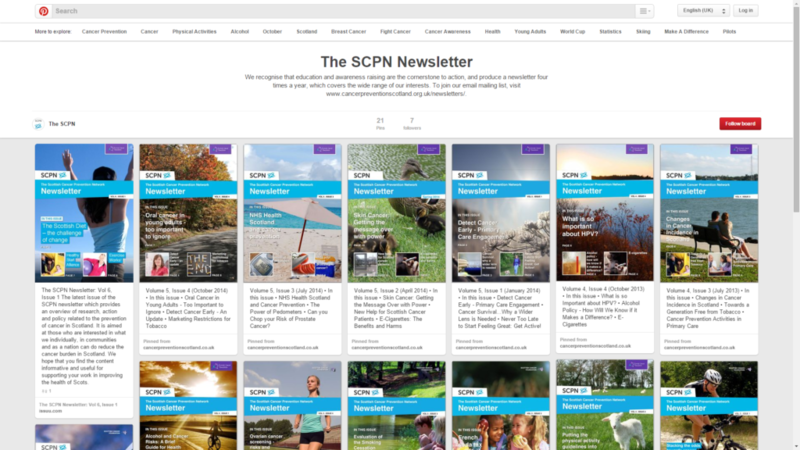 Even if you are not on our mailing list, you can view every published edition of The SCPN Newsletter, on our newsletter page and also on The SCPN Newsletter Pinterest board (pictured). If you were unable to attend our conference, or want to access the slides from previous conferences, the Conference Presentations section is the place for you. You can access every conference from 2011 – 2015, and we’ll soon be updating the previous conferences to show the itinerary, in the same format as pictured above for 2015. You will notice that slides from our 2015 Conference have been uploaded using SlideShare and embedded into our website (pictured). This means that you can view the slides directly on our website on almost any device, regardless of screen size, without having to download a program that can view PowerPoint presentations. Don’t worry though, you can still download the slides – you just have to click the link underneath (or the little SlideShare icon in the bottom right of the slide box), and you can download it from there. You can now access all of our new #SoupOnSaturday recipes right here on the website. Just head over to Resources > #SoupOnSaturday, and you can browse through a list of our recipes. 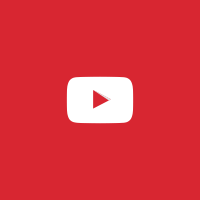 We’ll be uploading a new recipe each week throughout February and March. Curried Parsnip is pictured above! 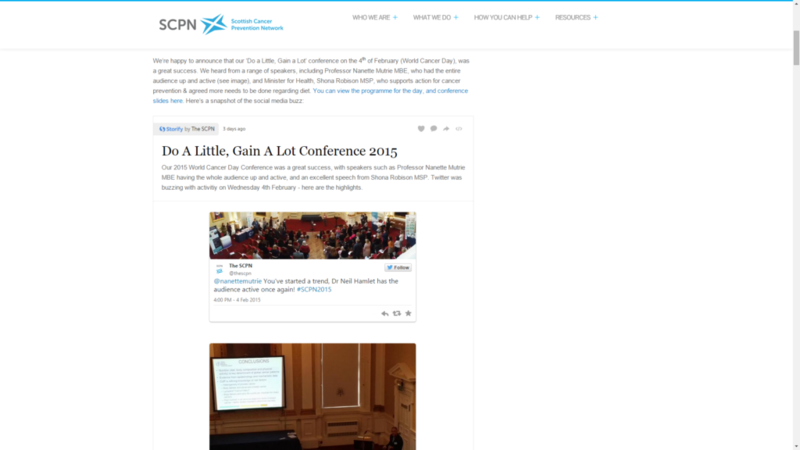 You can keep up to date with the work of the SCPN using the ‘What We Do’ section. We’ll be posting regular updates in the form of blog posts, which you can view here. Pictured above is the 2015 Conference, where you can view the Twitter activity of the day, through a series of immortalised tweets and images. In the ‘How You Can Help’ section, you can find out about the various ways you can help the SCPN, through ongoing campaigns, by contacting us, or by donating. In the near future, you will be able to make a donation online as pictured, but in the meantime, you can find the information on our text giving service. All donations are greatly appreciated! 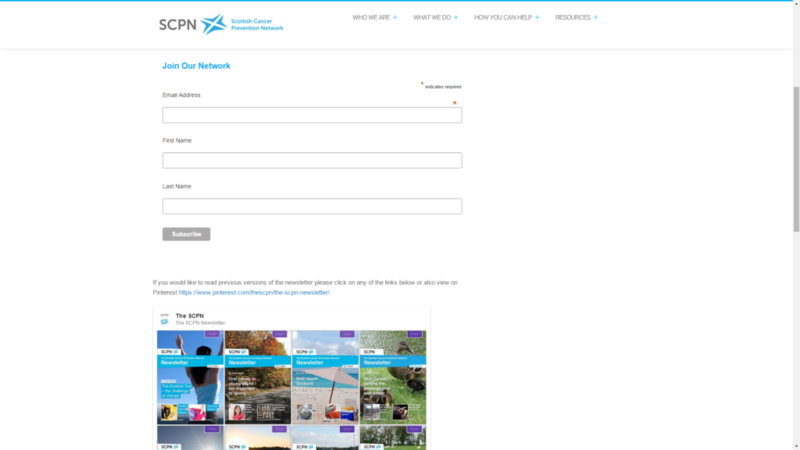 We hope you are happy with the new site as much as we are however, if you have any ideas you feel you’d like to see added to the site, send an email to scpn@cancerpreventionscotland.org.uk – any feedback is warmly welcomed!